It's probably come to your attention that there's a certain electronics show happening in Las Vegas at the moment. It's only the first week of January and we've already had the biggest tech event of the year, and it's been packed full of amazing gadgets and gizmos. You probably don't have time to read about the thousands of bits of kit on show this week at CES, so we've picked out 12 of our favourites to save you the trouble. Keep your eyes out for these wonders of consumer technology as they launch over the next 12 months. It might be a bit premature to say the W7 from LG is the best TV of CES 2017 - some proper, real-world testing is required for that - but it certainly wowed us with its svelte 2.57mm thickness, added to its OLED and Dolby Atmos tech, plus the integrated HDR and 4K capabilities. Samsung and Sony also had some impressive smart 4K TVs on show. We're suckers for a decent Chromebook and Google and Samsung have certainly delivered with the Chromebook Pro, the better-specced of the two Chromebooks Samsung launched at CES. The display can flip over and act as a tablet, it's capable of running Android apps, and it's fitted with some top-end components - what more could you ask for? Lego? Check. Educational? Check. Something for the kids? Check. Get your youngsters building and coding at the same time with a Lego Boost pack - the series is a step down from the Mindstorm models but comes with everything your kids need to get creative with some starter robots, including motors, sensors, mobile apps and a big pile of Lego bricks. We all enjoy a good sleep and if technology can lend a hand then so much the better. To add to your sleep-tracking wearables there's now the Sleep Number 360, a fully smart bed - it can warm different areas of the bed to send you off, as well as adjust its various configurations (like firmness and support) to suit your sleeping habits and positions. There were plenty of robots and Amazon Echo-style hubs on show in Las Vegas but we've picked out Kuri, not least because it was designed by an ex-Pixar employee. Kuri, like a lot of similar smart home robots arriving on the scene, can entertain your kids, keep an eye on your property, search the web for you, play music and podcasts, and much more besides. Really there's no way we can't include the Acer Predator 21X laptop, just for its sheer audacity. This $9k (£7k) beast of a gaming laptop was teased at IFA 2016 and comes sporting a 21-inch, curved screen, plus some serious gaming horsepower - including two Nvidia GeForce GTX 1080 X graphics cards. We've started saving up for one already. If you're after a smart box to put under your existing television set then you can't do much better than the Nvidia Shield TV, now upgraded with 4K support for video and games, plus HDR capabilities. Added to that, Google Assistant is coming to the box too, making this one of the smartest and most desirable TV boxes around. It's going on sale later this month. As well as smart hairbrushes and smart toothbrushes at CES 2017 we've also seen smart toasters - and we'd rather have a nicely browned slice of bread than perfect hair or teeth. The Griffin Connected Toaster can be controlled by your phone and remembers just how you like your toast, and there's a smart mirror and a smart coffee machine to go with it. And now for something completely different: a drone that goes underwater, letting you scan the depths of the ocean from the comfort of your boat deck. Oh, and it will even catch fish for you. We like the idea of the PowerRay a lot, and it includes LED lights and sonar scanning to find its way around. It should go on sale at some point during the next year. Now this gadget didn't completely blow us away, and it's still at the development stage, but we've chosen it as a marker for all the low-cost, high-quality VR/AR headsets coming to the market this year: with two 1440 x 1440 OLED display panels, a weight of less than 350g, and a price under £400, this Lenovo headset will help bring VR and AR to the masses. Can we pick a concept car as a gadget of CES? Looks like we just did: the Concept-i might never become a reality, but it's a vision of our self-driving future: it learns about your driving habits, takes over when it thinks you're too tired to drive, and can alert other drives to hazards. Also well worth a look is the FF 91 motor unveiled at CES by Faraday Future. 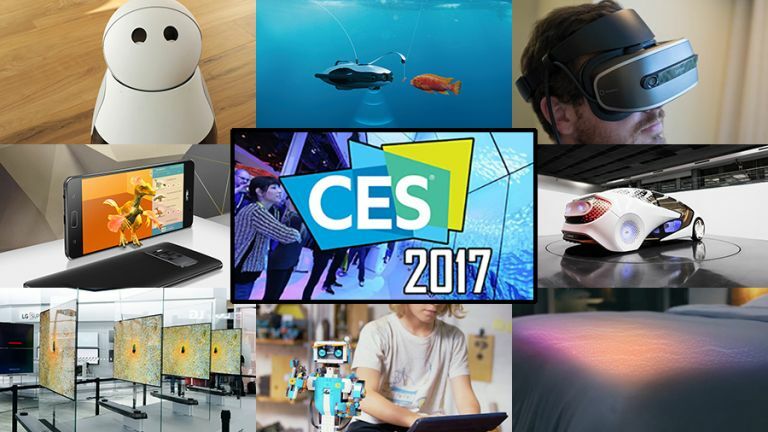 CES isn't known for its smartphones - you'll need to wait for MWC 2017 for those - but one handset that was unveiled was the Google Tango-enabled Asus Zenfone AR. With Google's smart augmented reality technology built in, plus a massive screen and some serious specs to help run it all, this could be one of the most innovative handsets of the year.